As part of the 2000 United States presidential election the state of Missouri chose 11 electors to the Electoral College, who voted for president and vice president. Missouri was a critical swing state. 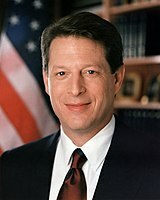 George W. Bush won the popular vote by a margin of just over 3% against his Democratic challenger, Al Gore. President Bush more than doubled his 2000 election margin of victory in 2004 over his subsequent challenger, John Kerry. 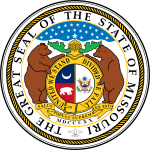 The 2000 election was seen as the turning point of Missouri’s bellwether status, which the state had maintained throughout most of the 20th century. Like Clinton, Gore was a Southern Democrat from a neighboring state of Missouri—Arkansas and Tennessee, respectively—and was widely seen as competitive in the state. As of the 2016 presidential election[update], no Democratic presidential candidate has won Missouri since 1996, despite Al Gore (as vice president), and Hillary Clinton (as First Lady) both being important officials in the Clinton Administration. (Later Democratic nominees John Kerry and Barack Obama were not involved in the Clinton Administration). As of the 2016 presidential election[update], this is the last time that Saline County, New Madrid County, Pemiscot County, Mississippi County, Ray County, and Clay County voted for the Democratic presidential candidate. Beginning with the 2000 election, the status of the Missouri bellwether came into question. Between 1904 and 2004, Missouri was carried by the victor of each presidential election, with the exception of 1956. Though Bush won the presidency in the 2000 election through the Electoral College, he lost the national popular vote. The 2000 election was unique because this was the first time in over a century where the popular vote winner lost the general election. (In 1888, Missouri voted for Grover Cleveland, the incumbent Democrat, who lost to Republican candidate Benjamin Harrison). Thus, controversy exists as to whether or not Missouri accurately predicted victor in this election. In the subsequent election, Missouri voted for George W. Bush, who this time won both the popular vote and the Electoral College. Missouri has voted reliably Republican since 2000. The state voted for John McCain in 2008, and for Mitt Romney in 2012, both of whom lost the general election to Barack Obama. The controversy is further complicated by the 2016 presidential election, where Missouri voted for Donald Trump by a landslide, while Hillary Clinton won the popular vote by nearly three million votes, but like in 2000, Trump won the Electoral College and became 45th President of the United States. Like 2000, political scientists have differing opinions on whether or not Missouri accurately predicted the victor, and even if Missouri is still a bellwether state at all. ^ "THE 2000 CAMPAIGN: THE MISSOURI CAMPAIGN; A Bellwether State's Favor Is Pursued by Both Tickets". mobile.nytimes.com. Retrieved 2017-12-17.